Whether it stems from the loss of a job, the anguish of heartbreak, or defeat in battle, failure, and the fear of it, is a potent psychological force. On the one hand, failure can be a strong motivator, a positive influence that will encourage some to excel in subsequent attempts. But on the other hand, failure can also be a powerful disincentive, leading to feelings frustration and low self-esteem, which can often translate into rash and destructive behavior. Sometimes the consequences are limited to the individual, who may withdraw completely to lessen the pangs of real or perceived humiliation, or exercise poor judgement in pursuing often self-destructive behavior. On other occasions, failure can influence an entire society, as history is littered with instances where entire nations have been galvanized by their failures. In the Twentieth Century, this was witnessed by the rise of the Third Reich, which was swept into power by bitterness stemming from Germany's loss of the Great War. In the Nineties, the world witnessed the numerous Balkan wars, which were fueled by the misguided nationalist sentiments of the Serbs, a people who have defined their entire culture on their suffering at the hands of others. Over the years, psychologists have identified a number of measures to help individuals (and even organizations) to cope with failure and the fear of failure, regardless of the cause. Instead of viewing one's abilities as a fixed or limited entity, it is important to view them from an incremental perspective, such that they can be honed through skills development and practice. Thus, coping with failure becomes an iterative path that focuses more on processes than outcomes. Under such a scheme, errors are treated as a natural and beneficial part of the learning process, effort is emphasized over ability and personal standards over normative standards, and intrinsic factors are used to motivate achievement, as opposed to caving in to external influences. These concepts are at play in director/actor Robert Redford's new film "The Legend of Bagger Vance", based on the 'zen golf' novel by Steven Pressfield. Similar to the manner in which Redford illustrated change management concepts in his previous effort "The Horse Whisperer", "The Legend of Bagger Vance" is the story of a man wounded by adversity and his struggle to reclaim both his self-esteem and passion. And though this sumptuously-shot film makes the occasional narrative blunder (particularly with the motivations of its characters), "The Legend of Bagger Vance" still manages to be an entertaining, and even occasionally inspiring, effort. The story is told through the eyes of Hardy Greaves (Jack Lemmon of "The Odd Couple" fame), whose childhood was marked by a pivotal golf tournament held in his hometown of Savannah, Georgia. The story then shifts to the first year of the Great Depression, where the richest man in town has built a magnificent golf course, only to take his own life after his fortune collapses. Determined to safeguard her father's legacy from foreclosure by the town elders, Adele Invergordon (Charlize Theron of "The Cider House Rules") makes a last ditch effort to pay off her father's debts by sponsoring a celebrity golf tournament. Even though the $10,000 prize attracts the talent of golf champions Bobby Jones (Joel Gretsch) and Walter Hagen (Bruce McGill of "The Insider"), who incidentally are real historical figures, the good people of Savannah demand that they have one of their own in the competition. Attention is then focused on Adele's ex-beau, Rannulph Junuh (Matt Damon of "The Talented Mr. Ripley"), who was once Savannah's pride and joy, as he was considered one of the top golfers in the country prior to the Great War. Unfortunately, after his entire unit was slaughtered on the battlefields of Europe, Rannulph returned to town a defeated man, and promptly withdrew from everything he cared for, including Adele. However, at the urging of young Hardy Greaves (newcomer J. Michael Moncrief) and Adele, Rannulph decides to re-enter public life to play in the tournament. Unfortunately, given that Rannulph has not picked up a golf club in over a decade, his game is more than a little 'off', since he has 'lost his swing'. 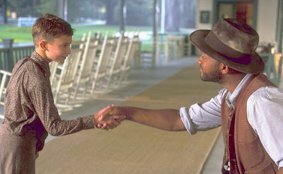 However, he gets a helping hand from a mysterious stranger by the name of Bagger Vance (Will Smith of "Men in Black"), who literally appears from out of nowhere. Acting somewhat like a guardian angel for golfers, Bagger is a soft-spoken sage who dispenses encouragement and wisdom to Rannulph, which gradually heals his wounded soul and rebuilds his tattered self-esteem. "The Legend of Bagger Vance" is a beautiful film to watch, as Redford uses the camera to lovingly capture the mystery and beauty found within the game of golf. Whether it be the graceful swing of a champion player, or the warm magnificence of the early morning sun's rays reflected off the greens, Redford has constructed a valentine for the game of golf, celebrating its simple pleasures. Even though I am not a golfer (I can barely hit the ball at a driving range), watching this film gave me an appreciation the hold that the game could have on a true admirer of the sport. 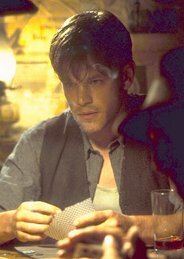 I also found it interesting how the character of Bagger Vance helped Rannulph get back on his feet, by helping him understand his irrational fear of failure and focusing his efforts on playing the game well, instead of being fixated on winning or losing. And even though they sometimes became a little overbearing, the golf-as-life aphorisms spouted by Bagger were quite clever in the context of Rannulph's path to rehabilitation. Unfortunately, where "The Legend of Bagger Vance" stumbles is in its slice 'o life Americana characters, none of which, Rannulph included, are developed to any significant degree. Though the film seems to follow the same outline of every other sports film (such as "Girlfight" or "The Replacements"), in which the underdog wins the day, the endpoint of "The Legend of Bagger Vance" is missing the expected emotional punch-line, which all boils down to character. For example, the motivation ascribed to Rannulph is nebulous, with very few clues provided to the viewer as to why defeat on the battlefield would cause an otherwise promising athlete to turn his back on everything he held sacred. Without such a reference point, it is difficult to ascertain the magnitude of the struggle he undergoes to conquer his demons. Likewise, Adele has all the characteristics of your stereotypical headstrong Southern belle, but the audience doesn't really get a chance to understand what makes her tick-- instead, she is relegated to the obligatory role of love interest. Bagger is also another mystery, since this one-dimensional character seems to be hanging around as Rannulph's caddy and dispensing philosophical musings out of the goodness of his heart. Will Smith certainly does a great job in this low-key role (which almost rivals his breakthrough performance in "Six Degrees of Separation"), but it would have been nice to see more. Finally, the use of Hardy as the story's narrator is also suspect, since the audience never gets a sense of how profound of an effect the tournament had on him. The framing of the story through Hardy's recollections seems more like a tired attempt to tell the story in an unconventional manner. After all, if "Saving Private Ryan" could get away with it, why can't "The Legend of Bagger Vance"? Unfortunately, unless the telling of the story has an impact on the present (or at least one's perception of the present), as it did in "Fried Green Tomatoes", it is more of a narrative gimmick, as it was in last year's "The Green Mile". In fact, the only interesting characters in the entire film are Rannulph's colorful opponents, the handsome Jones and the hedonistic Hagen. Though they are adversarial characters determined to win the tournament for themselves, they are also portrayed as real people with conflicting motivations. Though they are both at the tournament at the behest of their own egos, they truly love the game as sportsmen, and winning is only a small fraction of the enjoyment they derive from playing. "The Legend of Bagger Vance" is certainly one of the most beautiful sports films I have seen in a very long time, exalting the game of golf into an almost religious experience. It also touches on the psychology of rehabilitation, on how a siege mentality can be once again be made open to new possibilities. Unfortunately, "The Legend of Bagger Vance" also ends up being an emotionally-lukewarm effort that conveys little sense of satisfaction by the time the last reel unspools. Saddled with a number of one-note characters functioning as spokespersons for the themes being addressed, instead of truly interesting and complicated people to empathize with, "The Legend of Bagger Vance" is only good... not great.